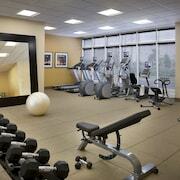 Hilton Garden Inn Toronto Airport West/Mississauga features an indoor pool and a fitness center. The hotel offers a restaurant. This 3-star property offers access to a 24-hour business center. Public areas are equipped with complimentary wired and wireless Internet access. Event facilities measuring 3500 square feet (325 square meters) include conference space. This eco-friendly hotel also offers multilingual staff, complimentary newspapers in the lobby, and a fireplace in the lobby. Complimentary self parking is available on site. Hilton Garden Inn Toronto Airport West/Mississauga has designated areas for smoking. Located in Northeast Mississauga, this eco-friendly hotel is 2.1 mi (3.4 km) from Iceland Arena and 2.5 mi (4 km) from Mississauga Hershey Centre. Centennial Park is 3 mi (4.9 km) away. This hotel features a restaurant, an indoor pool, and a fitness center. Free WiFi in public areas and free self parking are also provided. Other amenities include a 24-hour business center, conference space, and dry cleaning. All 152 rooms provide free WiFi and free wired Internet, LCD TVs with satellite channels, and conveniences like sofa beds and refrigerators. Guests will also find microwaves, room service, and coffee makers. Hilton Garden Inn Toronto Airport West/Mississauga offers 152 air-conditioned accommodations with laptop-compatible safes and complimentary newspapers. 50-inch LCD televisions come with satellite channels. Refrigerators, microwaves, and coffee/tea makers are provided. Bathrooms include bathtubs or showers, designer toiletries, complimentary toiletries, and hair dryers. Guests can surf the web using the complimentary wired and wireless Internet access. Business-friendly amenities include desks and phones; free local calls are provided (restrictions may apply). Housekeeping is offered daily and hypo-allergenic bedding can be requested. Buffet breakfasts are available for a surcharge between 7:00 AM and 11:00 AM on weekends. Garden Grill - This restaurant specializes in American cuisine and serves breakfast and dinner. Guests can enjoy drinks at the bar.